Be the first to share your favorite memory, photo or story of Mrs. Hilda. This memorial page is dedicated for family, friends and future generations to celebrate the life of their loved one. 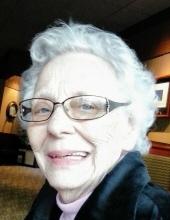 Mrs. Hilda S. Daniel, age 90 of Carrollton, Georgia passed away Wednesday, February 6, 2019. Mrs. Daniel was born in Coweta County, Georgia on August 3, 1928, the daughter of the late Andrew Story and Hattie Sue Howard Story. She retired from Nabisco with over 37 years of service. She was a member of Bethany Christian Church. Survivors include her nephews, Micheal (Paula) Holder, Albert Story; niece, Penny (Steve) Burns; great nephews, Keith Burns, Mitch Burns, Melvin Burns, Lee Earnest; caretaker and adopted daughter, Melissa and her husband T. Daniel; adopted grandsons, Terrian and Te-Jade Daniel. Besides her parents she was preceded in death by husband, Homer L. Daniel; brothers, Raymond Story, Robert Story and sister, Ruth Story Holder. Funeral service will be Friday, February 8, 2019 at 12 noon from the chapel of Almon Funeral Home with Min. Allen Howard and Min. Mike Wood officiating. The family will receive friends at Almon Funeral Home Friday from 11 a.m. until the service hour. Memorial contributions may be made to the American Heart Association, 1101 Northchase Parkway, Marietta, Georgia 30067. "Email Address" would like to share the life celebration of Mrs. Hilda S. Daniel. Click on the "link" to go to share a favorite memory or leave a condolence message for the family.